Composed circa 1720, this E minor sonata (HWV 379) is Handel's own compilation of movements taken from three other solo sonatas. Confusingly, this extra sonata has sometimes been numbered Op. 1, no. 1a, when in fact it never appeared in Opus 1. Of the eleven flute sonatas that are traditionally attributed to Handel, this is the only one that appears to have been genuinely intended for the flute, since it is the only one that survives in that form in Handel's own manuscript. Uniquely among Handel's solo sonatas, it falls into five rather than four movements. 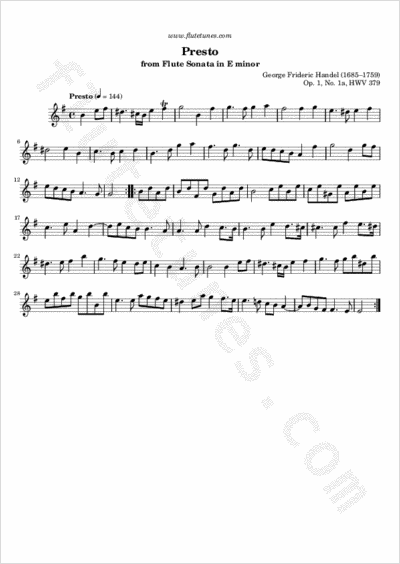 The concluding Presto we present today lets the flute sing over a jogging bass line; this, like the second movement (Andante), originated in the Recorder Sonata in G minor (HWV 360, Op.1, No. 2).